Booking an airline ticket during the peak months of the year is a daunting task. If you want to skip the chaotic procedure, then come directly to us. At Adventurous Andaman, we are engaged in providing dependable flight booking services to the tourists across Port Blair (Andaman Nicobar Islands, India). Our flight booking agents are associated with some of the leading airlines across India and abroad. 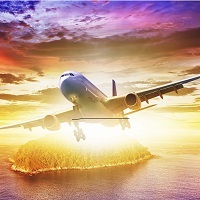 Thus, we can help you in getting tickets for domestic as well as international flights even in a case of exigency.